I just love a beautiful bathroom. 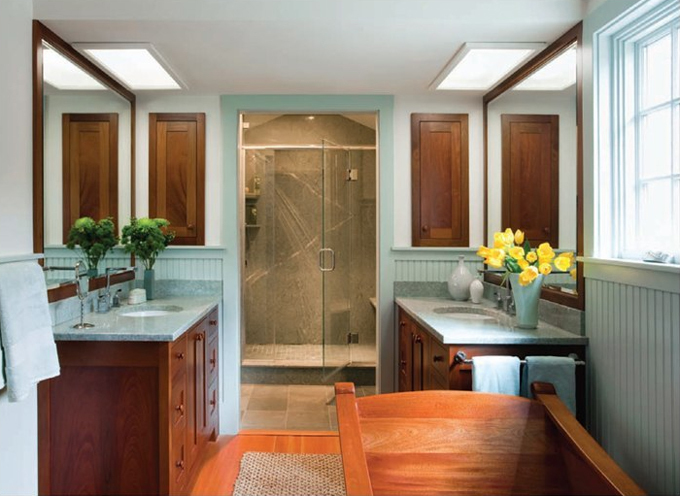 Whether it’s casaul or fancy…..a beautiful bathroom is a beautiful bathroom. I hope you enjoy today’s Eye Candy. I love all the beige & white and then the gorgeous dark wood cabinet. It really breaks up all the neutral in the room. 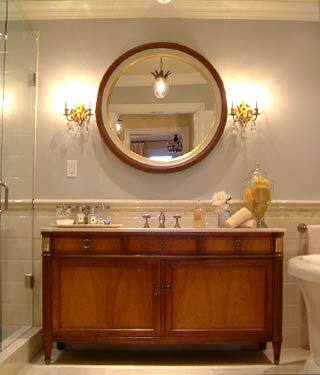 The little details in the room like the crystal knobs on the cabinet and the sconces really finish off the room. Check out how big this shower is. It even has two glass doors, one on each side. Plus to shower heads for each person. Nice!!! This bathroom is very simply, clean and has that spa feeling. Check out the top half wall and ceiling…..all the same color. Love that look. And that Bamboo ladder for a towel rack….genuis!!! Just brings in that little bit of warmth into the room with the Bamboo. Check out how many windows are in this bathroom. All that light just pouring in. Love where they put the mirrors….right over the windows. Love it!!! Love the subway tile on the walls & the penny tile on the floor, with the more modern styled tub, but the old fashioned faucet. New yet old. Love the look!!! Check out this modern bathroom with all of that open storage. Wicker baskets never looked so good. You don’t always need cabinets with doors to store your bathroom stuff away. Baskets with lids do the same job. Here we have a bathroom by Sarah Richardson. I LOVE how this woman decorates. Always so classy and gorgeous. Every room. But I love that she was able to mix in a little IKEA into her room. Check out the railing under the white cabinet with the small white baskets hanging from it. From Decorpad by Sarah Richardson from HGTV. I LOVE the look of this bathroom. Check out the ceiling, it’s blue. Black cabinet, mixed in with other small black accents around the room. 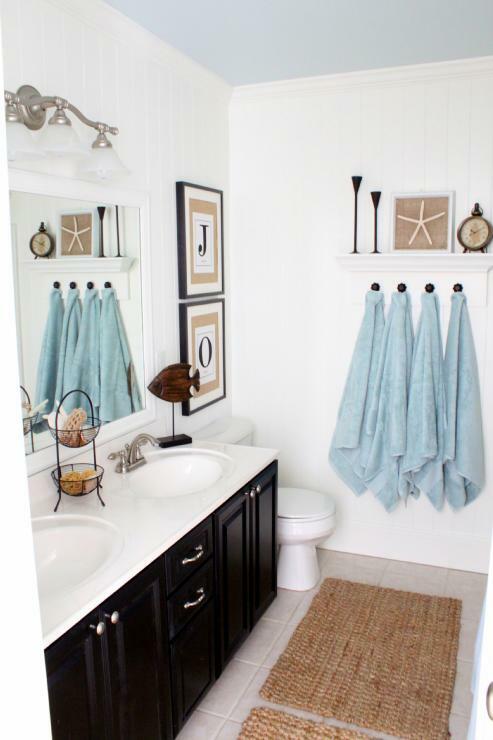 Still light and airy feeling to this beachy bathroom. Check out her website. She has a gorgeous home. This bathroom is very unique…..it has a wood tub in it. Check out the second picture and you can see the full tub. Instead of the wainscotting & trim being white, the walls are white and the wainscotting & trim is a blue/green. Goes great with the wood tones in the bathroom. 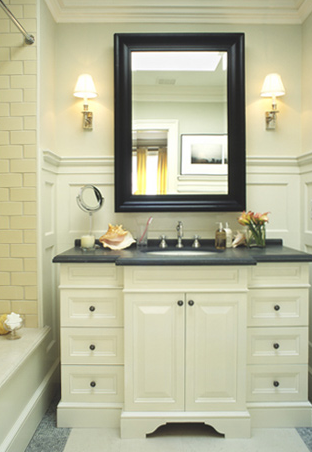 Love the statement of the large dark mirror in this bathroom. All the trim work in this room is gorgeous. Love the round mirror in this bathroom. It softens all the straight lines in the bathroom. All pictures are from decorpad. Thanks for stopping by. I would love to hear from you, so please leave me a message. Have a question, please let me know. I love to help others have a home they love. Have a great day everyone!! !